An incredible new seaside public bench in Littlehampton, West Sussex was recently crowned the "Longest Bench in the UK", and it may soon be able to claim the title of "Longest Bench in the world". 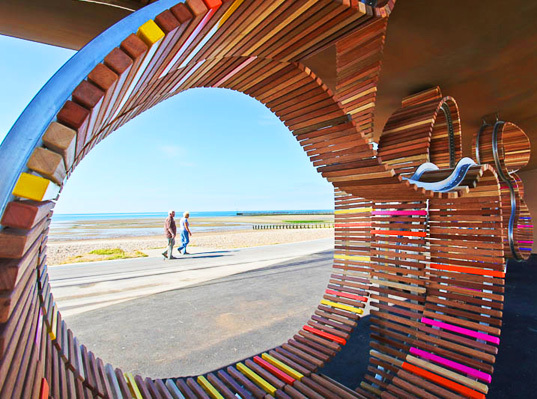 Designed by Studio Weave, the Longest Bench meanders and curves along Littlehampton’s beachside promenade for 324 meters and can seat up to 300 people. Built out of recycled steel and reclaimed hardwoods, the seaside bench is reminiscent of a beach boardwalk, but the twists, loops and dips make it playful and fun. Inspired by both a beach boardwalk and a charm bracelet, the Longest Bench meanders and loops like a chain and occasionally encounters shelters that act as “trinkets”. Composed of recycled wooden slats on a steel frame, the bench weaves along the coast, connecting the whole beach together in one long visual presence as it bends, swerves, dips, arches and curves for over half a kilometer. The bench meets with two shelters made from bronze-finished steel that provide shade and serve as entrances to the beach. As the bench approaches the shelters it stretches a bit and then spins into a series of loops inside, bouncing off the interior walls. The bench, which recently opened on July 30th, is 324 meters long and is made from an average of 70% recycled stainless steel. Thousands of slats were used to create the bench top, which were made from recycled and reclaimed tropical hardwood from various sources including old seaside groynes and landfills. Tropical hardwoods are proven to be durable in marine environments, and more than a dozen different species were used — they vary in color from pale blonds to warm pinks and rich browns. Plans still remain to extend the bench to 621 meters, which would make it a record-breaking bench. Currently the bench extends for 324 meters, making it the longest bench in the UK. There are plans to extend the bench up to 621 meters, which would make it the world's longest bench. The bench was inspired by wooden boardwalks as well as a charm bracelet. Here is one of the shelters, which acts as a "charm" on the long and twisty bench "chain". The shelters are made from bronze-coated steel and provide shade as well as an entrance to the beach. Reclaimed tropical hardwood was salvaged from landfills and old seaside groynes to create the thousands of slats used for the bench top. The colored slats are made from stainless steel box sections dipped in Nylon-11, a polymer enamel. The bench was designed by Studio Weave in collaboration with Arun District Council; Jane Wood and Sophie Murray, East Beach Cafe; Adams Kara Taylor; Jackson Coles; and Millimetre. The first phase of the project was completed and opened to the public on July 30th. Some of the bench slats are engraved with individuals names who donated to the project. The Littlehampton beach is backed by a strip of green and then a development. The new bench sits on the promenade between them and backs up to a red brick wall that extends along the beach. Diagram showing how the bench loops insides the shelters. Original inspiration for the seaside bench comes from traditional beach boardwalks. Inspired by both a beach boardwalk and a charm bracelet, the Longest Bench meanders and loops like a chain and occasionally encounters shelters that act as "trinkets". 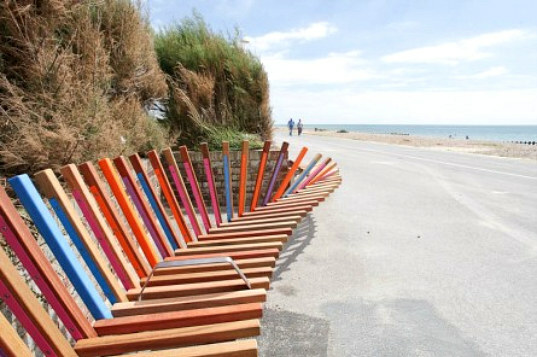 Composed of recycled wooden slats on a steel frame, the bench weaves along the coast, connecting the whole beach together in one long visual presence as it bends, swerves, dips, arches and curves for over half a kilometer. The bench meets with two shelters made from bronze-finished steel that provide shade and serve as entrances to the beach. As the bench approaches the shelters it stretches a bit and then spins into a series of loops inside, bouncing off the interior walls.